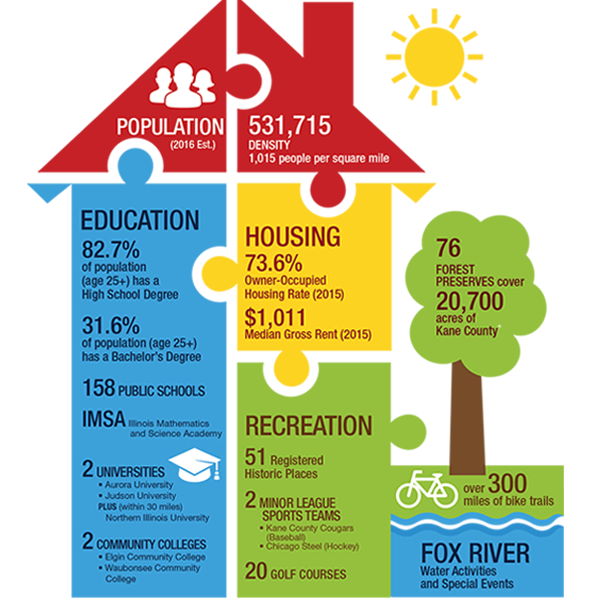 Established in 1836, Kane County is home to over 531,000 residents across 30 municipalities. Kane County is represent by a diverse, highly educated population supported by strong schools and world class community colleges and private universities. International businesses, such as Aldi and Mitutoyo, utilize Kane County’s robust workforce for their American headquarters. With over 300 miles of bike trails and 76 forest preserves to the Kane County Cougars and Chicago Steel, Kane County offers many different recreational opportunities for its residents and visitors.